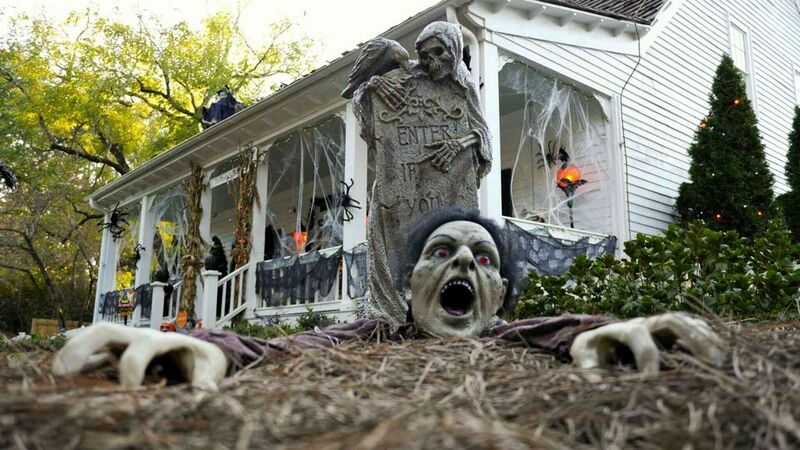 How do you get your Halloween yard props to stand out and look more authentic without having to buy genuine antique and weathered tombstones, statues, pedestals, pillars, and columns? Those fake tombstones you buy or make—usually from foam—can get some instant aging by applying faux moss made from common, everyday clothes-dryer lint. You know, the warm and fuzzy stuff you should be cleaning out of the lint filter of your dryer after every cycle. Artists and designers Shawn and Lynne Mitchell, authors of How to Haunt Your House, the go-to book for Halloween home and yard haunt DIYers, include this clever craft among their assortment of prop-making techniques. Here's a good motivator to do an extra load or two of laundry—the more dryer lint, the more faux moss you can make. Those with a multi-pet household are at an advantage here. Put away that lint roller. More cat and/or dog hair = more dryer lint. Wash a load of light-colored clothing—you've got light-grey -tinged dryer lint. Wash a load of dark colors—you've got dark lint. You get the idea. Once you have a big fuzzy wad of lint in hand (or faux hand, as pictured), it's time to gather your other tools and ingredients to make faux moss. Place some of the dryer lint in one of the bowls (pictured). Add some of the craft glue, then squirt the paint from one or more of the green craft paint bottles to get the desired color of moss for your tombstone, statue or pillar. "It's not an exact science," explains author Lynne Mitchell. "It depends on how much lint you have. Use enough glue and paint to change the color and make it tacky enough to apply." Use a gloved hand—preferably a real one—to gently mix the lint and liquids until all are moss colored. The green paint should not be mixed completely—you don't want a big muddy-looking glob. Once your mixture resembles something delicately "mossy," it will be time to apply it to your prop. Make sure you apply the faux moss immediately, before the glue and paint in the mixture dry out. Apply pieces of the mixture with gloved fingers while the moss is still wet. Press it into the prop surface, at the bottom, and to areas where moss would naturally gather and grow on cold, damp tombstones, statuary and pillars. Allow faux moss to dry after applying to prop. If needed, drybrush some lighter green mixture or paint on the moss for a highlighting effect. Here, Lynne Mitchell has aged a hand-made stone cross-style tombstone prop made from styrofoam. Mitchell added "grunge details" to the carved prop by dry brushing it lightly with white paint, then used a brown wash to "grunge it." Her final step was to add faux moss to random parts of the prop for additional aging effects. Details like the Mitchells' faux moss technique help to make their Pensacola, Florida, yard haunt, Mitchell Cemetary, appear authentic. Since the recipe is easy and the materials are free, don't you think it's time to haunt your own yard?